The Hartoy Porsche 935 has been on my wants list for a long time. I’ve been outbid again and again on the bay, so many times, in fact, that when this one came up, I placed a bid and went to bed. I wasn’t going to stay up until the wee hours just to be sniped at the last minute. I awoke to a different world, no one else had bid, and I won this car for 99 cents! This firm located in Florida began operations in 1982 and was founded by former Lesney Matchbox executive Elliot Harrowe. The first venture was to become the American distributor for Lledo and the Days Gone “Fantastic Set O’ Wheels” products originating from England. 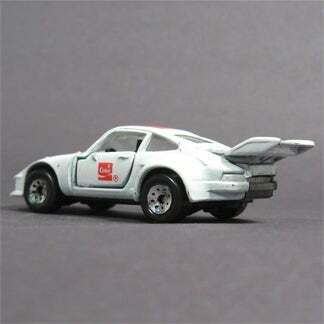 Hartoy under license also marketed various diecast Corgi Jr. and Welly castings with the Hershey Chocolate, Domino’s Pizza and Coca Cola logos. In 1988, the company changed ownership and sales were augmented with the inclusion of the larger Solido models into their inventory. In 1990, the 1-64 scale truck range called “American Highway Legends” was introduced which included older tractor-trailer rigs representing Mack BM and CJ, Peterbilt 260, & Ford. In 1993, Hartoy began producing models of contemporary Kenworth and Mack truck vehicles. I already have the VW Golf, in Coca Cola livery, but this is the icing on my cake!